Malty and complex, this big beer has a strong caramel backbone supporting oak and whiskey flavors with hints of dark fruits. The nose wafts coconut, toffee and a smooth hint of alcohol. The flavor and aroma merge, becoming one after just a single sip. There is a touch of bitterness, and it will age nicely. Food pairing suggestions: fatty foods, smoked brisket, grilled lamb, blue cheese, very sweet desserts. This larger-than-life beer is accordingly named after William Bligh, Vice Admiral of the Blue who was the captain of the HMS Bounty. 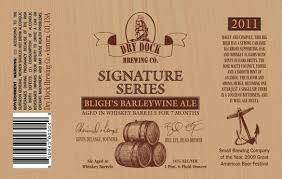 Originally crafted by Dry Dock Co-Owner Kevin DeLange, Bligh’s is a higher alcohol version of DeLange’s HMS Bounty Old Ale that has been barrel aged. Bligh made history when his crew lead a mutiny on board— the famous Mutiny on the Bounty— and he was set afloat in a small boat near Tahiti. Forty seven days later, the nautical hero arrived safely in Timor in the Dutch East Indies, an epic feat that created his long-lasting legacy. Bligh’s is available in 22-ounce bomber bottles, and less than 200 cases are distributed throughout the state of Colorado. The release of Bligh’s only happens once each year.